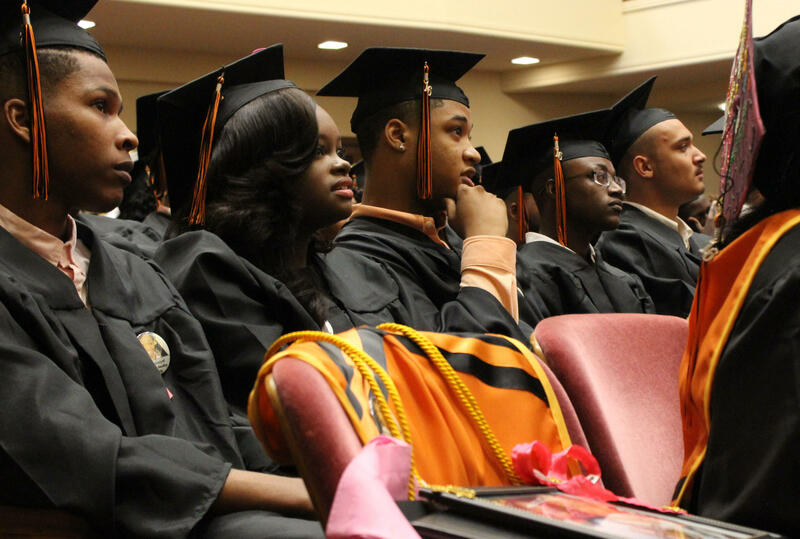 At the last graduation of Southwest Early College Campus, Nyla Brown listens to a performance by the Sunlight Baptist Church choir. In front of her, a seat remains open for classmate Daizsa Bausby, whose recent murder shocked, but pushed them to graduate. Southwest's 2016 graduation commenced Tuesday night at Unity Temple with the school's ROTC Color Guard. Tuesday night, donned in crisp, traditional black gowns, Southwest’s class of 2016 marched down the center aisle at Unity Temple. 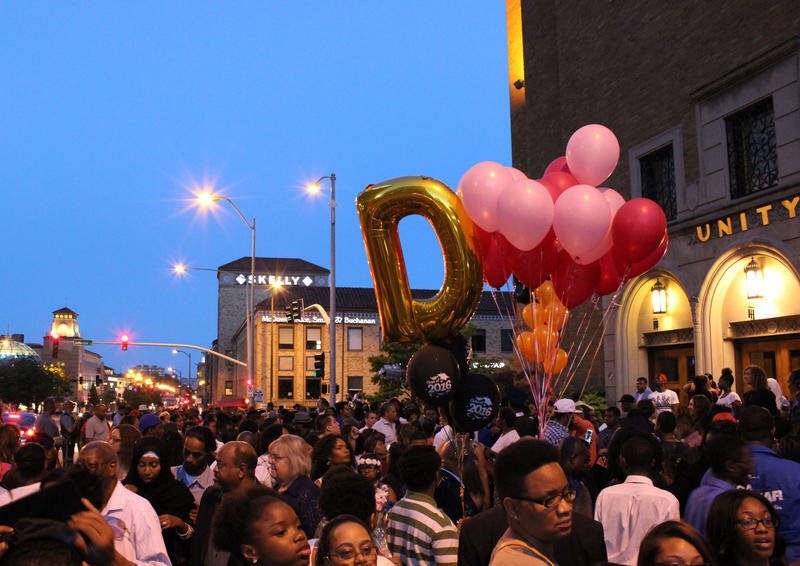 For a relatively small senior class, the turnout was massive — energetic family and friends filled the upper and lower balconies. 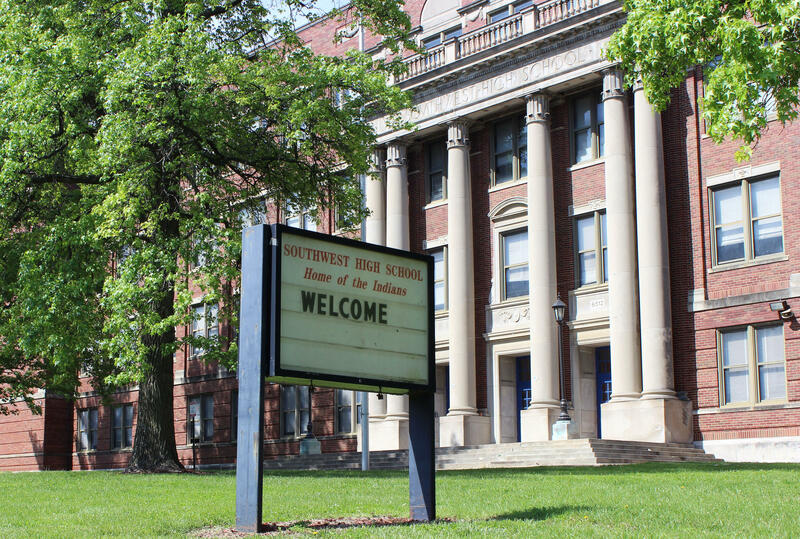 Southwest High has a long and storied history in Kansas City. It first opened as a public school in 1927. 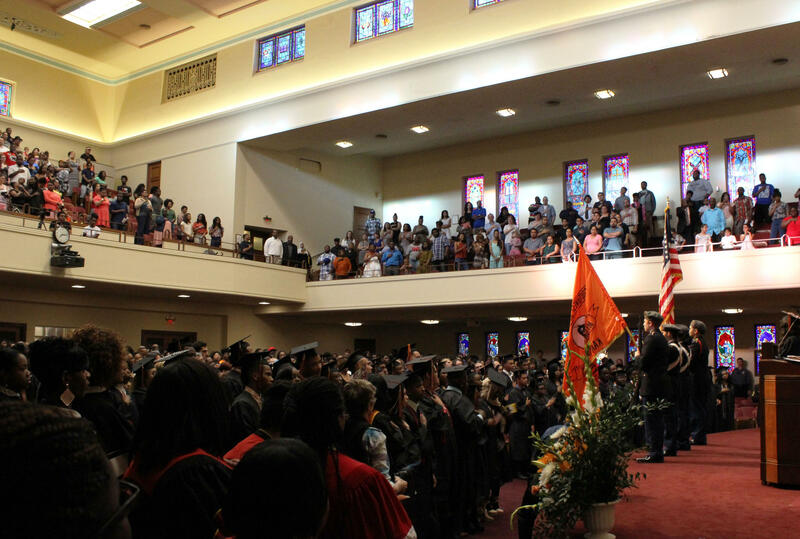 Alumni of the institution include public figures like Henry and Richard Bloch and famous rapper Tech N9ne. The historic school in Kansas City's Brookside neighborhood has a long history predating this group of students. The public school first opened in 1927. It became a charter school in 1999, then shut down in 2005. Three years after that, the district reopened the public school, launching a new early college program for an integrated middle and high school student body. “It actually felt like an early college,” recent graduate Hatiayan Watkins says. She began as a sixth grader in 2009, one year after the reopening. At the time, the school provided college credit courses taught by local professors, state-of-the-art science facilities for labs and experiments, and an onsite planetarium that was often a field trip destination for schools across the metro area. The early college curriculum was constantly evolving, under SWECC’s partnership with institutions like UMKC, the Woodrow Wilson Foundation and Donnelly College. School officials had a plan in place to cap each class at 120 students. But, in 2010, district-wide budget cuts shut down Westport High, sending 700 students over to Southwest, nearly tripling enrollment. That was former English teacher Shelia Witt’s first year teaching at Southwest. 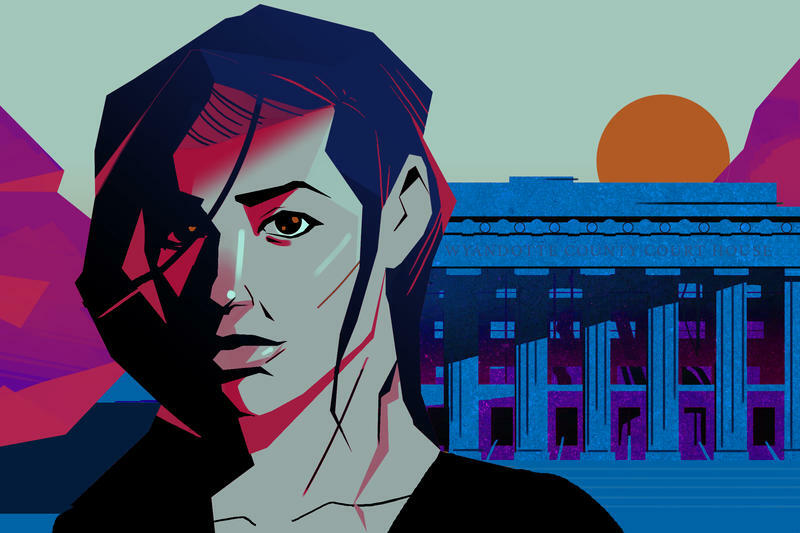 The years that followed saw fights, sexual assaults, and the disintegration of the early college program, as partners began to pull out in 2011. Over time, administrators began to lock empty classrooms, then gate off whole floors. Students had to start sharing old textbooks, and Watkins remembers rapidly cycling through many teachers and security guards. 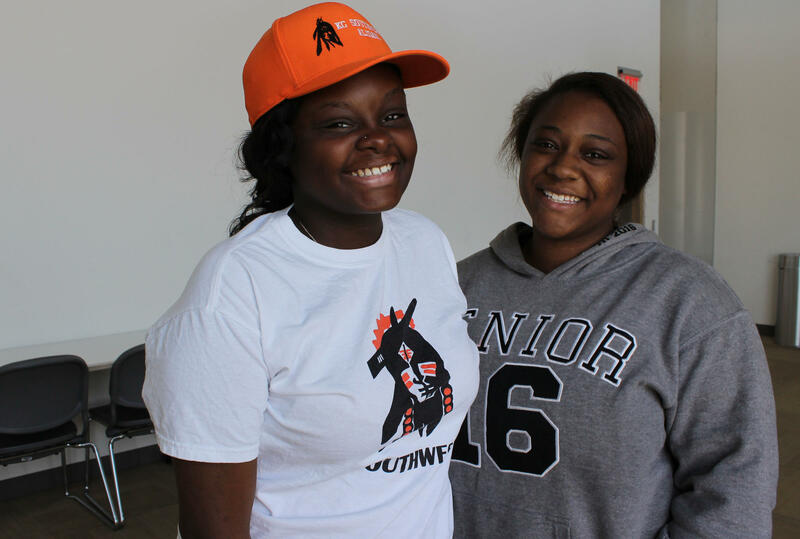 Recent grads Nyla Brown and Hatiayan Watkins worked hard through the turmoil at Southwest over the years to focus and learn what they needed to make it to graduation. 'The responsibility is definitely on us,' Brown says. 'It takes a village though.' They have a lot of love for their school and the teachers who stuck with them through it. Watkins’ classmate Nyla Brown says it took a toll on their education. The test scores showed it. Around 2012, the Missouri Department of Elementary and Secondary Education (DESE) identified Southwest as a “focus” school based on low-scoring performance reports. But what was almost worse to these students than the forces working against them from the inside, was the perception of them from the outside. Through all of this, the school was constantly making headlines for all of the turmoil. “No one really knows our truth,” Brown says. Part of that truth, is that around 70 students made it and walked across that stage Tuesday night. According to Elizabeth Mounteer, Missouri College Advising Corps adviser at Southwest, these students have been offered nearly $2 million in scholarship money. In April, three SWECC students — Omni Swinton, Kiz-Juan Sherrell and Shkenna Collins — were admitted on the spot, by the president himself, to Harris-Stowe State University. Jalen Gant was recruited for basketball by North Central Missouri College. And Hamad, the class president who spoke at graduation, received a Bloch scholarship to attend Donnelly College in Kansas City, Kansas. As for the remaining underclassmen, what’s next is still a little uncertain. To guide students and families during this time, the KCPS created transition teams to meet with students and other stakeholders. While the first few meetings saw a turnout near 30, recent meetings have dwindled to under 10, with students, parents, teachers and administration in attendance. According to the KCPS Master Plan, two years in the making, current Southwest students will transfer to Central High School or Southeast High School, which will be sharing a building, but not curriculum or mediate classes, with African-Centered College Preparatory (AC-Prep). Most SWECC students will go to Southeast, based on the new boundaries, designed to ease students’ commute to school. But, provided that students have their own transportation, they can go to any school of their choosing. “From my understanding, we’ve sent letters to every student affected by change,” school board member Matthew Oates announced at a recent meeting of the Southwest Faith-Based Coalition. The volunteer group has worked closely to support the students over the years. At the meeting, some coalition members, like Bill Tammeus, expressed concern that the students haven’t been given enough information about their options for next year. Furthermore, the district’s announcement of the closing of SWECC came too late for students to apply to signature school’s like African-Centered Prep, Paseo Academy or Lincoln Prep. District officials did not reply to requests for comment on the transition. While some feel the district’s efforts have been adequate, others still have questions. Southwest parent Wilbur Dunnell says he received a letter or two about it. Ke'Montay Smith, a junior at SWECC, is sad to see her school closing. Smith will start at Southeast High in the fall, along with most of her current classmates. 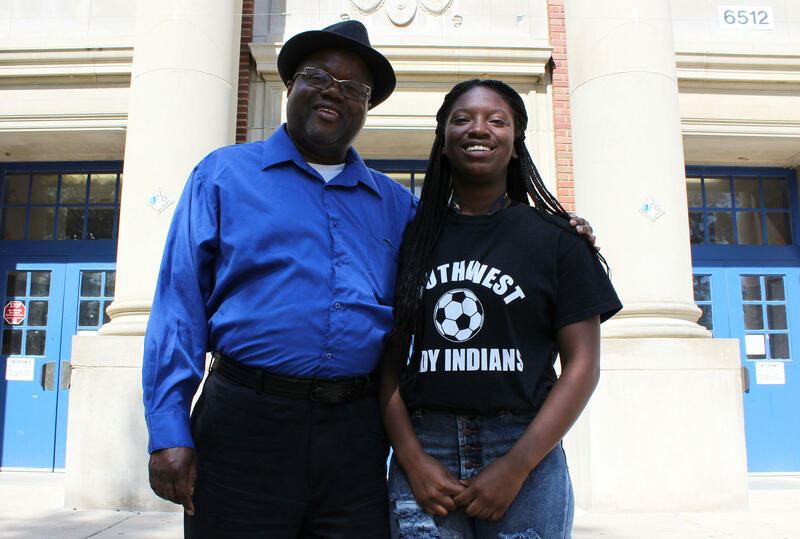 Her father, Wilbur Dunnell, says he's received basic information from the KCPS, but some things are still up in the air, and from a parent's standpoint, that's daunting, especially as his daughter enters her senior year. “There’s always some things up in the air, looming, and it’s scary from a parent’s standpoint,” Dunnell says. His daughter, Ke'Montay Smith, has excelled at SWECC. She’s a member of the ROTC, has played on many of the available sports teams, and has been involved in the 20/20 Leadership program. Over the past few years, Smith’s grades have improved, just like that of many of her classmates. 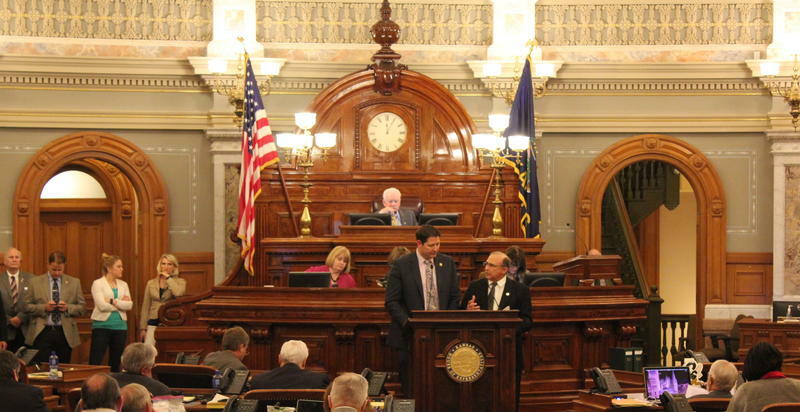 Tony Stansberry, the Kansas City area supervisor for the state Department of Elementary and Secondary Education, says that SWECC students did show academic improvement, though it has been incremental. Dunnell says he understands budget cuts, but he’s concerned about his daughter assimilating to a new environment, especially during her senior year. But that uneasiness is something the recent graduates and underclassmen experienced all along. And, ultimately, they say they wouldn’t change the experience they had in high school; it brought them closer together. Editor's note: This story was the first of a two-part series on Southwest High School's final graduating class. Read or listen to the second part, about the murder of Daizsa Bausby, who was to have been salutatorian of the class of 2016. Andrea Tudhope is a freelance contributor for KCUR 89.3. You can reach her on Twitter @adtudhope.